Every woman who’s gone through a pregnancy has a secret. Or many. Share yours! Ranging from “Eat a spoonful of ghee every day” to “Listen to Mozart for expecting mothers”, we’re sure you’ve heard a load of tips for a happy, healthy pregnancy. But, what did YOU do for a happy and healthy pregnancy? This month, Women’s Web in association with Westland Books brings you the “Passport To A Healthy Pregnancy” blog contest. The contest runs from 13th October to 24rd October. Read on for more details and don’t forget to put up your entries on time! 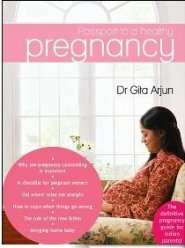 Westland Books, our contest partner has an excellent resource for expecting mothers, Passport To A Healthy Pregnancy by noted obstetrician-gynaecologist, Dr. Gita Arjun. India’s first definitive guide for expectant parents, Passport To A Healthy Pregnancy covers topics ranging from pre-conceptional counselling to demystifying pregnancy and explaining away the many myths that surround it to the care of the newborn itself. The book holds rare insights into the physical and emotional needs of both mother and child—with a chapter dedicated to the modern would-be father as well. 1. Share your “Passport” to a healthy, happy pregnancy, and help other moms-to-be (and win prizes!) Blog about any 1 tip, activity or suggestion that helped you during your pregnancy – physically or emotionally. 2. Make sure you include the contest title in your post (Passport To A Healthy Pregnancy) and also the following code. (Just copy it in the html view of your blog editor). 3. Leave us a comment here so we can make sure we’ve got your entry! The entries will be judged by Dr. Gita Arjun and the Women’s Web team, based on the relevance of your suggestion to expecting mothers, as well as how interestingly your blog post is written. And now the prizes – it’s raining books from Westland Books, so get started on your entry! 2. Two 2nd prize winners each receive a copy of Chicken Soup For The Indian Mother’s Soul and Parul Sharma’s Bringing Up Vasu, a delightful novel on the first year of motherhood. Contest open from 13th Oct to 24th Oct 2011. We’ll be tracking entries until 9 p.m. Indian Standard Time on 24th Oct; do make sure you get your entry up in time. – Contest open to readers around the world, but at the moment, we can only send prizes to a valid address in India. – Blog posts that don’t use the contest title and code will not be eligible for prizes. Heres my entry 🙂 Hope people like it! Thank you very much for giving me the chance. can people without blogs participate? Thanks all for sharing your entries – delighted, and looking forward to more participation! @Preethi – sorry, this time, it’s purely a blog contest. Thanks for conducting this contest. I have an entry. Thanks for the opportunity. WW: My previous comment has a link that doesnt work, this was pointed out by Scribby, fellow contestant.. thanks so much Scribby.. I now have the new link, hope this works.. Thank you each and everyone for your entries – what a lovely collection of posts to help mums-to-be. We close entries now and will announce the results towards the end of this week – stay tuned! Passport To A Healthy Pregnancy: Contest Results!